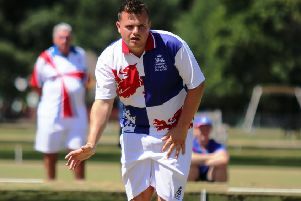 Four Northants bowlers produced an impressive showing during the annual British Isles Indoor Championships. The event at Stanley IBC, County Durham, is for the five countries (Channel Islands, Ireland, Scotland, Wales and England), where the current holders of their country’s title in the various disciplines represents them. The various disciplines include Singles, Junior Singles (Under-25), Pairs, Triples, Fours, all for both genders and Senior Fours for the men. Wellingborough duo Chloe Wordingham and Jamie Walker were competing in their roles as Women’s National Junior Singles champion and Men’s National Singles champion respectively. And Andrew Manton and Neil McKee (Kingsthorpe) were also involved as the Men’s National Pairs champions. Wordingham faced a junior singles semi-final against Chloe Watson (Ireland) and it proved to be the close match most expected. The pair were locked together pretty much throughout the contest but, with the score at 16-16 after 21 ends, Wordingham picked up a maximum count of four shots to close in on victory. Her 21-17 success was confirmed when she picked up the single she needed after Watson had earned a shot in the next end. That win earned Wordingham a final against Scotland’s Stacy Laidlaw, who put the Wellingborough player under the cosh as she reached 18 shots without reply. Wordingham picked up five shots over the next four ends but the Scot eventually sealed a 21-5 victory. Walker also reached the final in the after he beat Billy Mellors (Scotland) 21-16 in the semi-final, having been in front from the start. In the final against Wales’ Damian Doubler, Walker took a 17-8 lead after 13 ends to put himself on course for the title. But Doubler battled back and allowed Walker just two more shots over the next ends and, with two maximum counts, it was the Welshman who edged to a 21-19 success. Manton and McKee met Welsh champions Jordan Davies and Phil Carpenter in their pairs semi-final. The two duos exchanged shots to leave the scoreline at 8-8 at one stage but a big count of four shots against them on the seventh end proved crucial as they were never able to recover. Davies and Carpenter went on to complete a 26-18 victory. Jamie Walker and Neil McKee stayed on at Stanley to compete for England as they took on Ireland, Scotland and Wales in the British Isles Indoor International Series. Walker was playing at number three on the rink skipped by Sam Tolchard while McKee was at number two in Graham Shadwell’s line-up. England beat Ireland 105-91 in their opening game, although Walker’s rink lost 19-11 while McKee’s won 15-11. A more comfortable victory for England followed when they beat Wales 133-84 with both Walker’s (22-16) and McKee’s (23-11) rinks enjoying wins. England went into the final clash with Scotland knowing they could afford to lose and still claim the Series. That was the way things panned out as Scotland claimed a 112-107 success but England still won the overall event and the Hilton Trophy on shots difference. Walker’s rink enjoyed a 22-20 win but McKee’s was beaten 21-18 in the final match. Northamptonshire Indoor Bowling Association president Trevor Tilley took a select team to his home club Wellingborough to take on six invited rinks in a match organised in aid of his chosen charity, Prostate Cancer UK. Tilley had invited six of the County Bowls Associations to provide a rink in opposition and each of them did so, meaning there were 48 Northants bowlers on show. The match didn’t go the way of the president’s team, although they only kept the deficit to 14 despite losing on four rinks as the visitors triumphed 120-106. The highest scoring rink for the visiting team was that skipped by the home club’s Walt Winsor with a 16-shot advantage. The generosity of those who attended ensured a total of £481.50 was raised on the day. Rink scores - (NIBA names first) Rink one: (NIBA v Northants Retired Police BA): Don Scott, Trevor Tilley, Geoff Allen, Geoff Hunt 11 Clive Appleton, Mick Warren, Pete Simmons, Tim Robinson 23. Rink two: (NIBA v Northamptonshire Women’s Indoor BA): Stuart Lowe, Bryon Mills, John Chester, Michael Moulton 15 Pat Starsmore, Julie Spreadbury, Val Blackwell, Joyce Porter 24. Rink three: (NIBA v Bowls Northamptonshire): Pete Mellor, Brian Langton, Bob Sullivan, Norman Gibb 13 Velda Cooper, Heather Lack, John Cooper, John Haines 27. Rink four: (NIBA v Northamptonshire Vice Presidents BA): Dougie Cooper, John Smith, Terry James, Bernard Spreadbury 24 Colin Incles, Roly Smith, Dave Williamson, Roy Cave 9. Rink five: (NIBA v Wellingborough IBC): Will Clelland, Alan Diver, Tony Warren, Brian Diver 10 Dennis Collins, Bryn Walker, Mick Cooper, Walt Winsor 26. Rink six: (NIBA versus Cavaliers BA): Jim Diver, Keith Howlett, Bob Tingle, Dougie Ainsworth 33 Peter Kneeshaw, Peter Boulden, Harvey Fruish, Mick Hall 11. Northamptonshire men are gearing up for the final of the National Inter County Over-60 Championship on Sunday. They take on Hampshire at Nottingham IBC (1.30pm) and team manager John Haines has now selected his side for the big occasion. Northants team – Rink one: Jim Diver, John Haines (both Desborough), Pete Maloy (Kingsthorpe), Malc Mattinson (Rushden Town). Rink two: Will Clelland, Norman Gibb, George Warren (all Desborough), Pete Morris (Kingsthorpe). Rink three: Alan Baulch, Alan Ramscar (both Northampton & District), Bob Care (Kingsthorpe), Walt Winsor (Wellingborough). Rink four: Mick Richardson, Mick Sharpe (both Kingsthorpe), David Bailey (Wellingborough), Tony Weston (Northampton & District). Rink five: Roger Summers (Northampton & District), Colin Manton, Colin Jones, Jim McKee (all Kingsthorpe). Rink six: Tony Dicks, Bernard Spreadbury, Mick Worthington (all Daventry), Martin Keech (Rushden Town). Reserves: Pete Mellor (Desborough), Dave Whittles, Terry Britten (both Northampton & District), John Baggat, Alan Spencer (both Kingsthorpe).